During the festival of Succoth devout Jews live in a sukkah, a temporary dwelling meant as a reminder of the period of wandering in Jewish history. 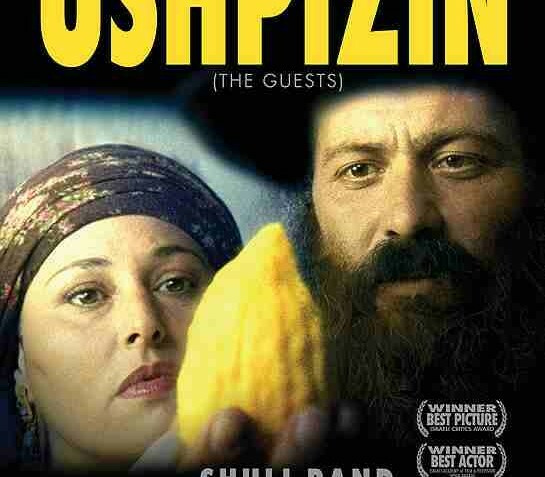 It is considered a blessing to host "ushpizin" (guests) in the sukkah, but in the case of the hero of Giddi Dar’s wise and delightful film, the blessing becomes something of an ordeal as well. Placed in the Hasidic community in contemporary Jerusalem, Ushpizin centers on a happily married, but poverty-stricken and childless, couple, Moshe and Malli. As the holiday approaches, they have no money to buy the materials to build a sukkah, not to speak of the four species of key symbolic importance in observing the festival: etrog (a citrus fruit native to Israel), lulav (palm branch), hadas (myrtle branch) and arava (willow branch). Husband and wife pray intensely for a miracle, and – lo and behold – they receive a charitable windfall. But once their sukkah is built, guests arrive unexpectedly – an unsavory pair linked to Moshe’s less virtuous past. The guests are but the first in a series of setbacks that besets the couple; their miracle seems to evaporate into a progression of trials, one after another. When it seems that things have reached bottom, Moshe is told by the rabbi that all trials are tests from God, that there is no rest, that life will always dish out yet another, harder test. It’s a stern lesson, but Ushpizin is intended as a parable, a fable in the tradition of Isaac Bashevis Singer, and life’s trials are invariably followed by joys as well. Carefully balanced on a fine line that encompasses both gentle humor and spiritual wisdom, Ushpizin draws the audience into its exotic world and shares its universality. Shuli Rand, who wrote the screenplay, also stars as Moshe, instantly calling to mind the Tevye of Fiddler on the Roof. Rand’s wife, Michal Bat-Sheva Rand, plays Malli, and the warm emotional connection between the two actors is palpable. A klezmer-influenced score adds significantly to the atmosphere and mood of the film – an infectious, sinuous melody line in a minor key: sadness always inextricably connected to joy, joy invariably tinged with sadness.